This is a very brief post to let you know that you can now find the presentations from the Geospatial in the Cultural Heritage Domain – Past, Present & Future over on the event page we have set up. 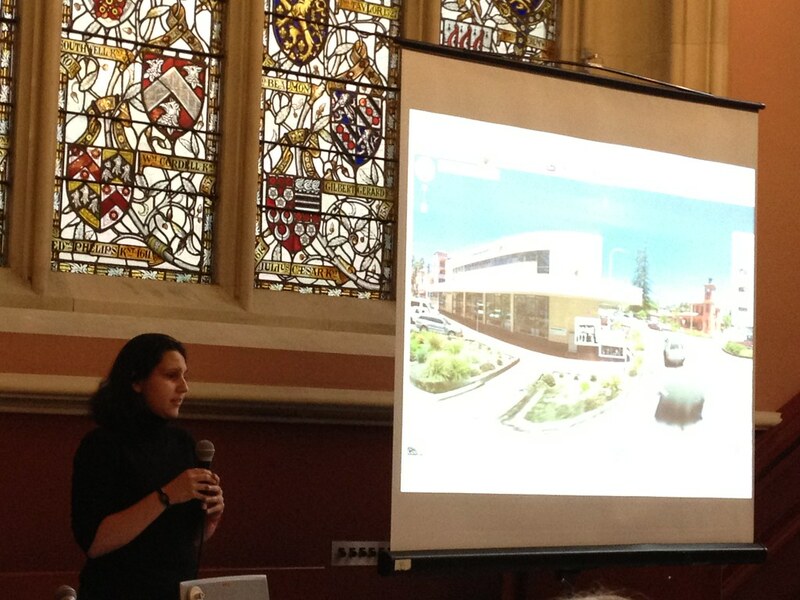 The liveblog can be found here and is full of detailed notes from the presentations. We have also made the images of the event available over on Flickr, access all of the images from #geocult here. If you did attend or blog about or otherwise commented on the day do let us know and we’ll link to your post from the event page or our storify archive on the event. And finally… we will be uploading audio of all of the talks and discussions along with video of some of the presentations very shortly. We’ll let you know when they go live! If you are following the event online please add your comment to this post or use the #geocult hashtag. Happy New Year from JISC GECO! A Very Happy New Year from all at the JISC GECO project! The JISC geo projects have all presented their final products to the world at the end of 2011 and we are looking forward to seeing how those tools and resources are used by the community throughout 2012 – and you have a favourite project, a great example of how you are using one of the products created or ideas for how they should be developed we’d love to hear from you. We expect 2012 to be an exciting year for all things geo – it is after all the centenary of the Scott Expedition to the South Pole and the year in which the London Olympics will create a whole new excuse for geospatial tie-ins and visualisations! The JISC GECO team will be blogging about geo and INSPIRE throughout the year and we will also be running several events this spring beginning, kicking off with a geo culture event in late February. If you are interested in taking part please drop us an email or watch out for further news here on the blog. As ever we welcome guest posts, particularly from UK Further and Higher Education geo community, and your suggestions for posts or events that should be mentioned here. In the meantime here is something sparkly to properly celebrate the fact that it’s a brand new year! January 9, 2012 Posted by Nicola Osborne at 11:39 am Misc. Comments Off on Happy New Year from JISC GECO! 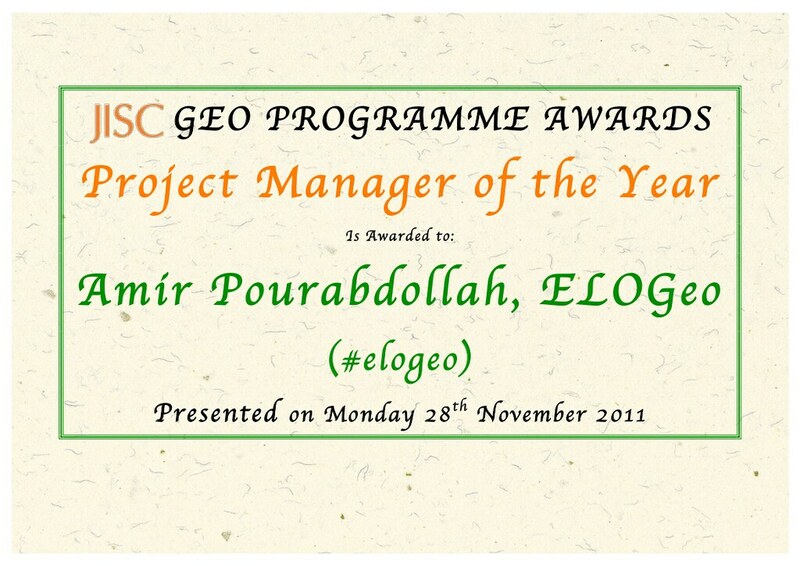 This post has now been updated to reflect the results of the JISC Geo Awards. Following the Show & Tell session the JISC Geo Programme Awards were presented to projects in the JISC Geo programme based on their achievements to date and, in the case of the Best Project award, the votes of the community collected at the end of the Show & Tell Session. 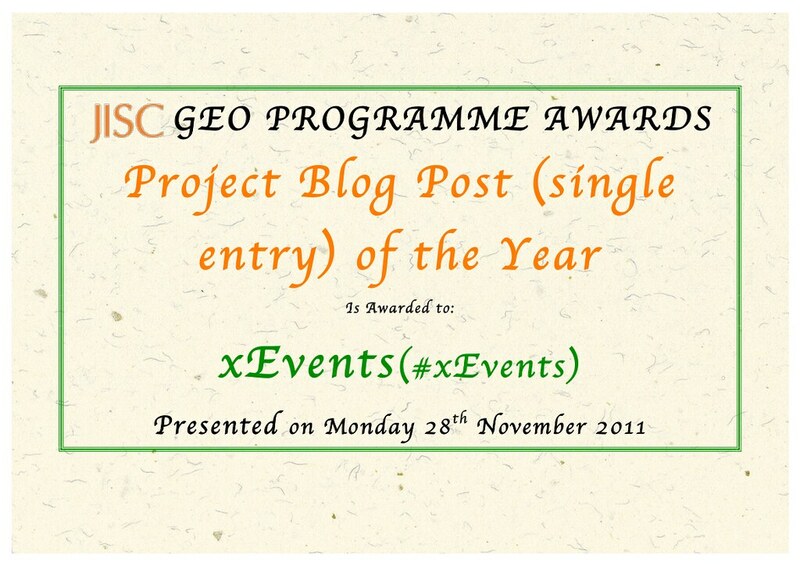 Project Blog Post (Single Entry) of the Year was awarded to xEvents (#xevents). 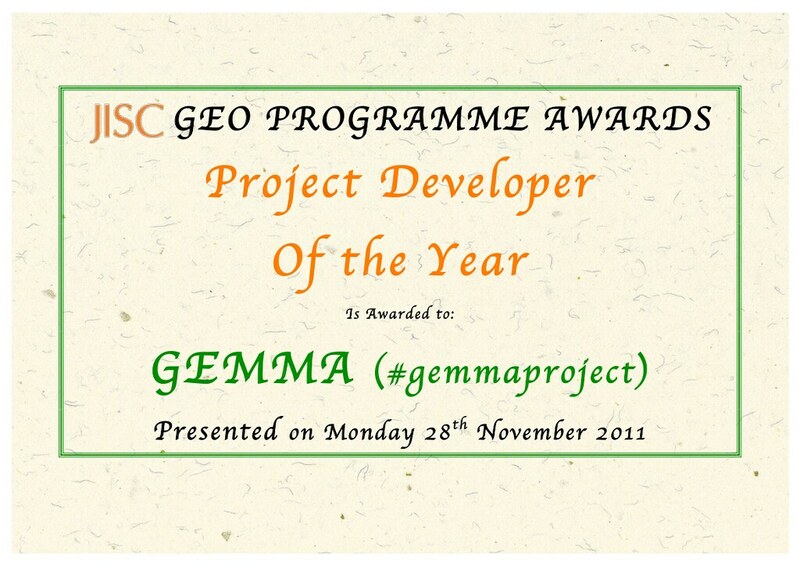 The nominees were: GEMMA (#gemmaProject); IIGLU (#jiscG3); NatureLocator (#naturelocator); xEvents (#xevents). 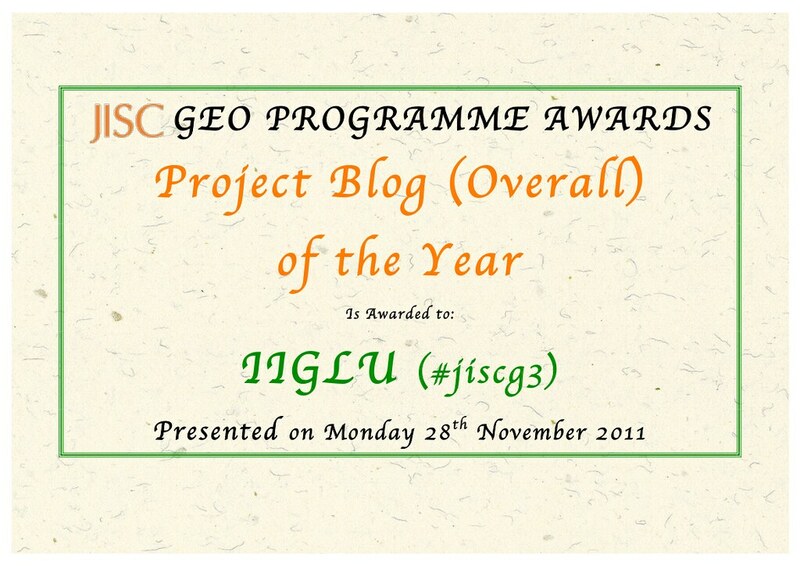 Project Blog (Overall) of the Year was awarded to IIGLU (#jiscg3). The nominees were: GeoSciTeach (#GeoSciTeach); IIGLU (#jiscg3); NatureLocator (#naturelocator); PELAGIOS (#pelagios). Amir Pourabdollah, ELOGeo (#elogeo); Chris Higgins, IGIBS (#iGibs); Stuart Macdonald, STEEV (#STEEV); Elton Barker, PELAGIOS (#pelagios). 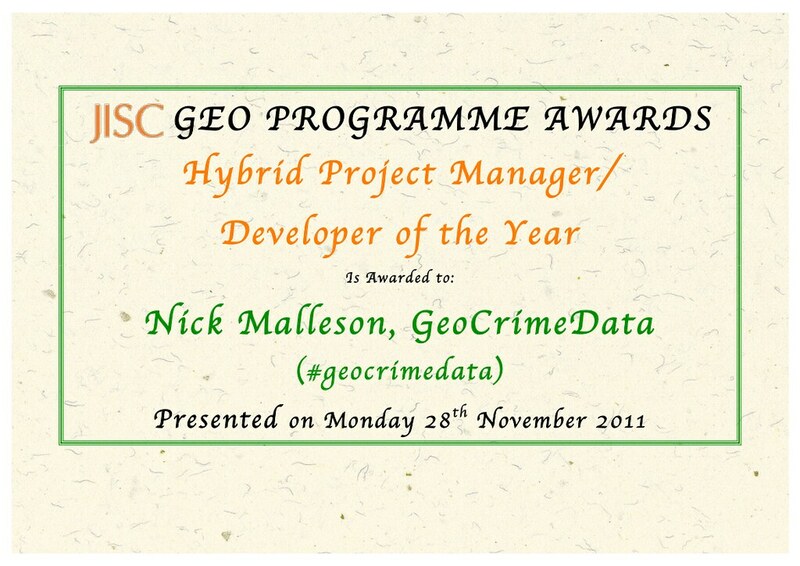 Hybrid Project Manager/Developer of the Year was awarded to Nick Malleson, GeoCrimeData (#geoCrimeData). GEMMA (#gemmaProject); Halogen 2 (#halogen2); PELAGIOS (#pelagios). 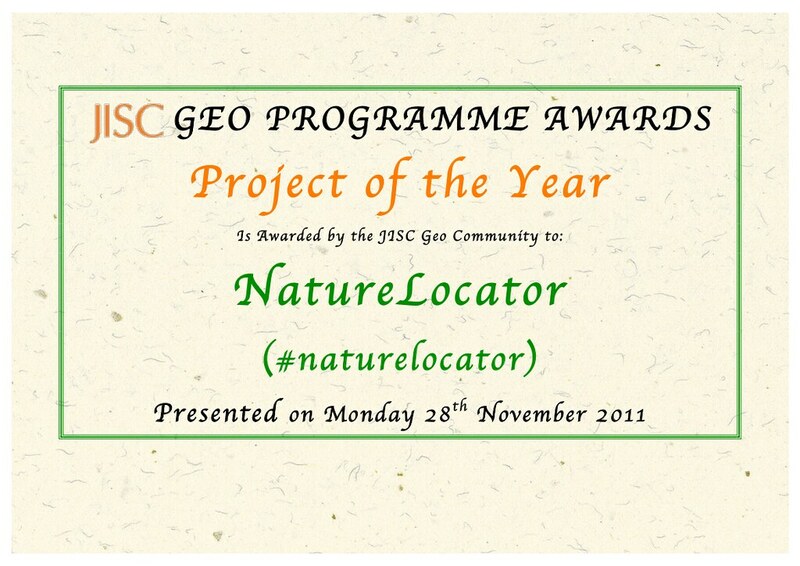 Project of the Year was awarded by the JISC Geo Community, via voting at the JISC Geo Programme meeting, to NatureLocator (#naturelocator). The nominees included all 12 of the JISC Geo projects. If you are one of our fabulous project winners please do feel free to post a copy of your certificate on your own blog. You can download them from the JISC Geo Flickr Set. Today we are in day two of the JISC Geo Programme Meeting and we are liveblogging as appropriate – so any spelling issues etc. will be corrected as soon as possible – please do comment on content etc. below. David Flanders of JISC is introducing the day: The aim of today is to identify recommendations for the future. There will be three sessions which run as presentation and then break out groups around a theme. Each table will have a scribe. The goal will be to discuss potential recommendations for how JISC should advance spatial. That recommendation will then be written up by the project manager and the scribe for a given group and posted on that project’s blog and they can then be looked at further, a soft of ad-hoc community consultation. We will run this process three times today. Today we are blogging from the JISC Geo Show & Tell event taking place at RAVE (Ravensborough College), which sits right next to the Millennium Dome/O2 Arena in London. The hashtag for today is #jiscgeo – please tag any of your own blog posts, images or tweets with this. The full programme of JISC Geo Programme Meeting events over the next few days can be found here. The day will split into 2 halfs. This morning we will have a Keynote from Julie Sweetkind-Singer, Assistant Director of Geospatial, Cartographic and Scientific Data & Services, Stanford University. This will be followed by an introduction to all of the JISC Geo projects by David F Flanders, JISC Programme Manager for Geospatial Innovation. Then we will break for lunch and in the second half of the day there will be a Show & Tell session where each project shows off their work around lab-style tables. We will be liveblogging the first half of the day but then manning both a INSPIRE table and a JISC GECO events table so we will blog highlights of this afternoon towards the end of the day. David Flanders, is introducing us to the day with an alert to keep that QR code reader app handy – there’ll be lots of QR codes appearing through the day… Also there will be blogging, tweeting, images, videos, etc. going on all day. All of these should be available under Creative Commons licences and available after the event. Please make your posts etc. available similarly and use the #jiscgeo hashtag.